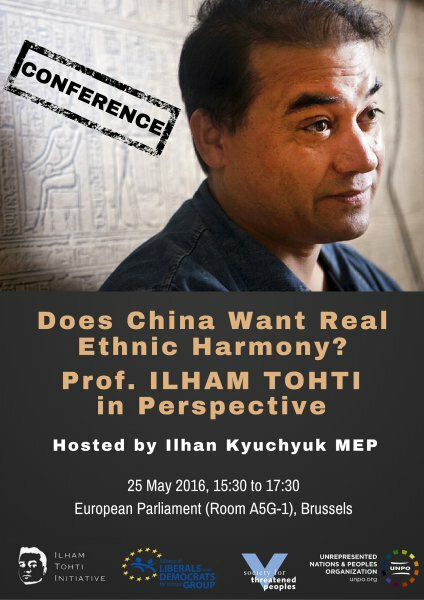 The Unrepresented Nations and Peoples Organisation (UNPO), in coordination with the Ilham Tohti Initiative and the Society for Threatened Peoples, will be convening a conference entitled “Does China Want Real Ethnic Harmony? Professor Ilham Tohti in Perspective” at the European Parliament in Brussels. Hosted by Mr Ilhan Kyuchyuk MEP (ALDE), the event will draw attention to the imprisonment of Professor Ilham Tohti, as well as to the ever-increasing suppressive policies of the Chinese Government towards the Uyghur people. A renown Uyghur economist, writer and professor, Ilham Tohti has worked peacefully to build bridges between ethnic communities in accordance with Chinese laws, focusing his research and advocacy on improving relations between Uyghurs and Han Chinese. However, in September 2014 Tohti was imprisoned for life without a fair trial, which sends the message that there is no longer room in China for an outspoken moderate. Since then, his case has attracted the support of several international human rights groups. For instance, In 2014, Tohti’s courage in the face of adversity for the right to freedom of expression was recognized by the prestigious PEN/Barbara Goldsmith Freedom to Write Award. Against this challenging background, the conference will invite high-level panellists with a twofold objective: to raise awareness of the overall situation endured by Uyghurs in China - especially precarious following Beijing’s ‘anti-terror’ policies passed in 2001 - and to gather international support for the case of Ilham Tohti. The event will bring together academics, human rights experts, policy-makers and members of the Uyghur diaspora and will be open to anyone interested in the global struggle for freedom and justice. Register by filling in this form before 20 May 2016.